On its path to become the “battery of Asia”, Laos has planned a series of major dams along the Nam Ngum River, a tributary river of the Mekong. The Nam Ngun 2 dam, located in Vientiane province, is among those already in operation, just 35km north-east of the downstream Nam Ngum 1 dam . The project was first planned during the 1990s, when feasibility studies and Environmental Impacts Assessments (EIA) where conducted by Finnish engineering company Pöyry, which would later on become supervising engineer , in spite of an apparent conflict of interests. Put on ice during the Asian financial crisis, the project received again momentum in March 2006, when agreements to move forward were signed with a consortium of developers (see project details) . EIAs were completed, but not disclosed, violating National Hydropower Policy . Construction started at the end of 2006, and as of end of December 2010, the dam, awarded with the International Milestone Rockfill Dam Project Award , was ready to produce electricity for export to Thailand . 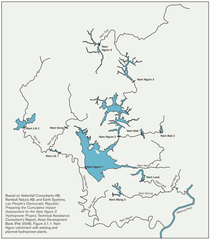 However, when the dam’s reservoir of 12,200ha was first filled with water, water levels of downstream Nam Ngum 1 dam dropped so much, requiring to important electricity from Thailand to cover the shortfall . During construction, no less than 6,100 people from 17 villages, largely ethnic minorities Phuan, Tai Dam, Tai Deng, Khamu and Hmong, needed to be displaced [3;5]. People were unable to participate in the planning of the so-called “focal sites” ; common resettlement areas for all different ethnic groups, which were reported to lack sufficient access to land to support livelihoods . Others reported evidence for human rights abuses in the procedure of how evictions occurred . Downstream impacts include reduction of fish stock in the Nam Ngum 1 dam reservoir, on which more than 9,000 people depend, while the Nam Ngum 2 reservoir has little potential for reservoir fisheries . In addition to the well-known environmental impacts of lams, such as blocking of migratory fish species and other irreversible changes in aquatic and riparian ecosystems, the transmission line was constructed within the Protected Area Phou Khao Khuay NPA, leading to further habitat fragmentation within the park . Finnish company Pöyry presents the dam as a success story, in which, during the peak construction period no less than 6,000 persons were employed for the dam, hence, providing substantial local employment . This short term employment, however, needs to be contrasted with an irreversible economic, social, cultural and ecological loss, jeopardizing more than 6,000 indigenous people, which are carrying the costs for the benefits of a few companies, the Lao government and energy-demanding Thailand . 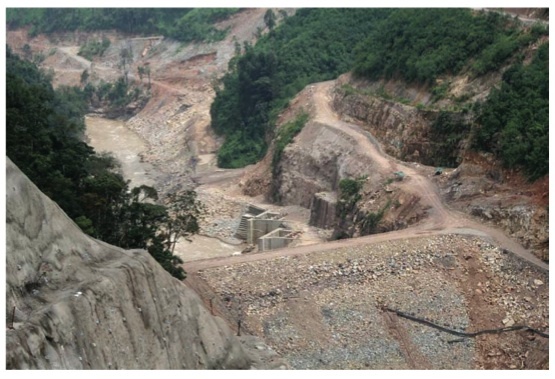 Project Details Nam Ngum 2 dam is a concrete face rockfill dam with a high of 182 meters  and a width of 485m . The reservoir expands over 12,200ha. The construction was completed at the end of 2010 and commercial operation started in March 2013 . The installed capacity amounts to 614 Megawatt (MW) and the dam has an annual production of 2220GWh . The investment size was reported to amount to $832 million . The project is a BOT project (build-operate-transfer), in which the ownership will be transferred to Lao PDR after several decades of operation . The produced energy is sold by agreement to the Energy Generating Authority Thailand (EGAT). Therefore, a 98km transmission line(230/500kV) needed to be constructed , partly located in protected areas . The dam is operated by Nam Ngun 2 Power Company Limited. According to International Rivers , as of 2010, the involved developers held the following shares: CH. Karnchang (Thai) 28.5%; EdL (Laos) 25%; Ratchaburi Generating Co. (Thai) 25%; Bangkok Expressway PCL (Thai) 12.5%; Shlapak Group (USA) 4%; PT Construction & Irrigation Co., (Laos) 4%; TEAM Consulting Engineering (Thai) 1%. Finnish company Pöyry conducted feasibility studies and impact assessment, and later became supervising engineer . Technology (turbines) was supplied by Japanese Mitsui and Toshiba . there were likely also other groups mobilizing, though no information could be found so far. Why? Explain briefly. The project went on. International Rivers, 2010. 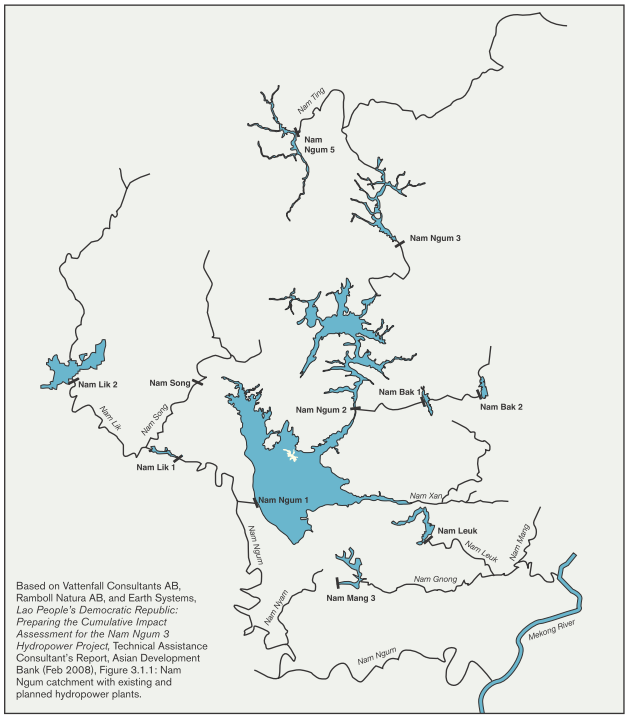 Existing and planned Hydropower Projects. (accessed 10/03/2015). Asia. ASEAS - Austrian Journal of South-East Asian Studies, 5(2), 292-315.